A unique location with lots of information about Rennes. 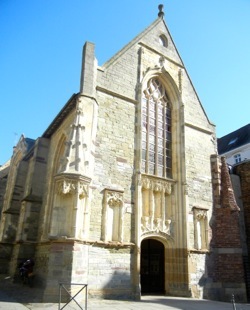 The Office de Tourisme in Rennes, at the corner of rue des Dames/rue Saint-Yves and rue G Dottin, is unexpectedly located in the historic Chappelle Saint-Yves, so look for a church-like building bearing an Office de Tourisme sign. Enter on the side from rue Saint-Yves; the entrance on rue G Dottin is to the exhibition hall and bookshop. It may not look like a Tourist Office, but it is!